Despite the improvement on a quarterly basis, it can be argued the stock is still expensive. 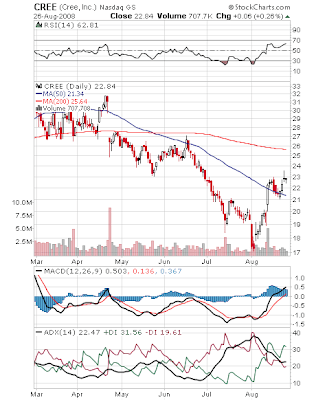 With a PE of 60, a Price/Sales ratio of 4 and a PEG of 2.6 Cree is no bargain at its current price of $22.84. So far, though, the stock has managed to hang onto its gains. Today on Barron's Tech Trader Daily site, Eric Savitz may have offered a reason. Apparently, there are all kinds of rumors floating around about Cree. One is that IBM might make a bid for the company. Another is that Cree and Korean company LG are planning to set up a joint venture in China, to make LED backlights. According to Andrew Huang, an analyst at American Technology Research, the stories range from "makes no sense" to "unlikely". In summary, Cree has exceeded Wall Street expectations but still seems a bit expensive. Based on future earnings potential as a prime supplier to many of the leading users of LED backlighting technology, the stock could tack on more gains if the tech sector rallies. Without that kind of rising tide, though, investors may allow the stock to sink back below its 50-day moving average. As I usually recommend, it's always a good idea to put the Alert HQ stocks on a watch list and see what happens.